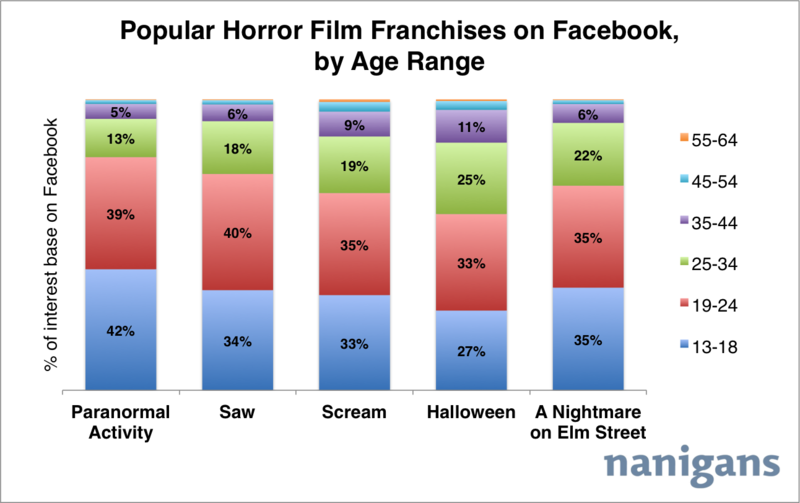 Highest Grossing Horror Film Franchises: How Does Popularity Compare on Facebook? Happy Halloween! If you’re not trick-or-treating tonight, you’ll surely be catching a classic horror movie on television. When it comes to franchises, Friday the 13th takes home the #1 spot in being the highest grossing horror franchise of all time — $380,637,525, or $31,719,793 on average for each of the twelve movies (that’s not counting the TV show and video game). Saw comes in at #2, grossing $342,510,598 overall, or $34,251,060 on average for each of the ten movies. Given many of these franchises are over thirty years old, we were curious how their popularity compared today on Facebook. Paranormal Activity, with just three movies in its franchise so far, is the most popular horror film franchise on Facebook. Saw comes in second, but the two leave all other franchises in the dust. 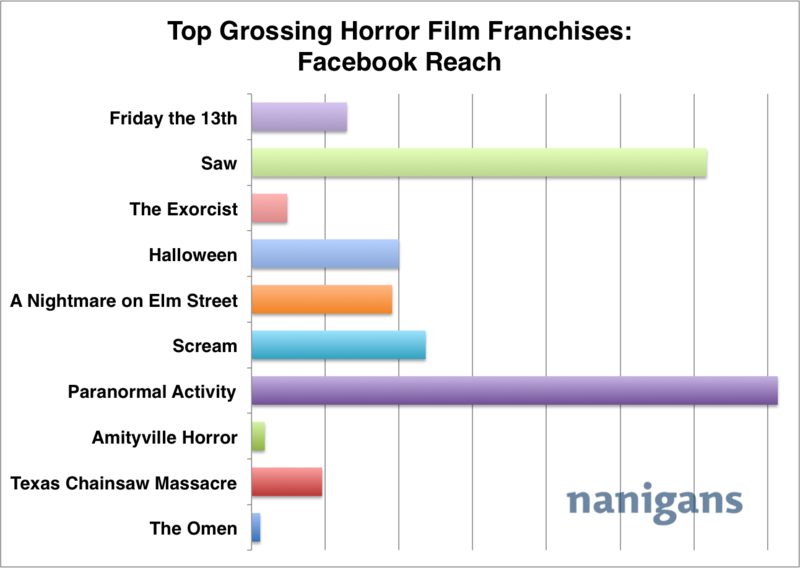 The Omen and The Amityville Horror franchises come in at least popular on Facebook — likely because they are two of the oldest (the first film in the franchises were released in 1976 and 1979, respectively). We then dove deeper into our Facebook campaign data to compare the five most popular franchises on the social network by age and gender. Overall, older people do not tout their love for these horror film franchises on Facebook. For all of these films, over 60 percent of their interest base are between the ages of 13 and 24. Paranormal Activity resonates with the largest portion of 13-18 year olds on Facebook, and, alternately, the classic Halloween tends to resonate with the oldest crowd. 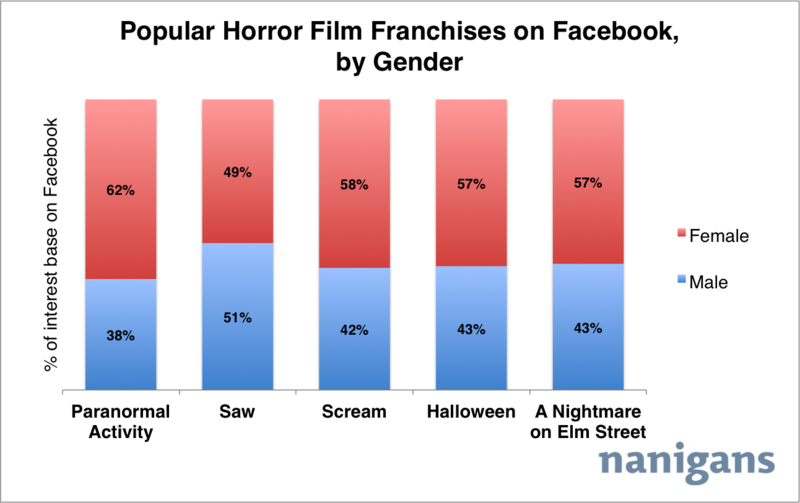 Across the board, more females than males are interested in these horror film franchises on Facebook. Paranormal Activity has the highest portion of females interested in the film (62 percent), while Saw has the highest portion of males (51 percent). Does anything surprise you about the data? Let us know in the comments!